After writing about agronomy for a year, I decided I would do something different. Even though I have gained two more chins due to the number of prescription drugs I have been on for the past six months and my complete lack of technical skills, I decided I would start doing video interviews with all types of people either directly or indirectly involved in agriculture. Nothing scripted or even really edited, just a one on one conversation about agronomy. For the first interview, I sat down with a friend I’ve known for a while now to get her take on what agronomy means to her as a homesteader and let her ask a question or two as well. Meet Diane, a backyard gardening homesteader from somewhere in Pennsylvania. Can you believe it! This is the last you will hear me using the phrase, The 52 Weeks of Agronomy. Unless I turn it into a made for TV movie or a fiction novel and travel the world doing book signings. I don’t think that is happening anytime soon. I tried to watch the video I made for week 27 and convinced myself the only saving grace was I didn’t take my clothes off. It’s so bad I’m not even putting a link to it. My family is still petitioning me to remove the link to it altogether. It has been a wild journey getting to this point. After taking some time and re-reading several of the posts, I can say I’ve laughed, cried, and wondered” What the heck was I thinking when I wrote that!? However, one thing keeps coming to mind when I look back over the last 52 weeks. Soil, much like people, follows one golden rule. You know, that rule we all heard about as kids. It’s that simple. There is no complicated formula, no fancy terminology needed, no industry jargon to convolute and be confused by. Just give back what you have taken. Why should you give back…? To keep soil productive and plants reproducing you have to continually manage the fertility needs of both. Giving soil back what it needs to support the plant's recreational activities that ultimately benefit us. That’s it — nothing more, nothing less. My titles have not become any more creative, but I get my point across. This is the second to last post of the 52 Weeks of Agronomy Series. I would be lying if I didn’t say I’m slightly relieved. At the same time, I’m looking forward to having more time for other projects that do not require typing, or at least me doing it. Maybe one will require me wearing out a red pen ripping apart someone else’s grammar. Who knows!? What I do know is that we have come to the time of year farmers have questions. They have them year-round, now they have more time to ask them. One of the most recent questions I’ve gotten is regarding the different types of agronomic testing available to farmers and growers. “As far as the sap and Brix's testing, from an agronomic standpoint they won't change any soil fertility recommendations I would have. Everything I look at and take into consideration is based on soil tests in conjunction with tissue testing depending on the type of crop, farming system, and whether the grower will see an economic return for the costs of the tests. I'm looking at the actual nutrient levels of nitrogen, phosphorus, potassium, calcium, etc. There are so many variables like time of day the sample was taken, what part of the plant was sampled, and what calibration standards were used, it would make it difficult for an agronomist to base a soil fertility assessment on sap and Brix's levels. There are always variables in any kind of testing; you can't mitigate for everyone. However, soil and tissue testing are the best tools currently an agronomist has to look at what is going on at that moment in time. Here are some common agronomic tests, followed with a brief description and some of my thoughts on them. In general, this test shows what nutrients are immediately available to a plant because they are not bound to a colloid. It is also one of the most accurate tests for measuring soil salinity which can be a common problem in soils in the central and western part of the country. Some agronomist’s feel a standard soil test plus the paste test is the most accurate way to determine soil fertility needs. In my experience, it is farm, soil type, and management dependent as to whether you will see a return on investment for the extra cost. As stated before in my email response; tissue testing utilizes dry matter - it’s a picture at the moment at that part of the plant sampled as to what is there. It is a good measure of the nutrient status of a particular plant at that moment in time giving you a picture of what may typically be happening. It is a good indication of the efficacy of your fertility program as well. Tissue tests are dependent on timing, plant temperature, and growth stage the sample was taken. Typically, guides are offered for the plant stage at which a tissue sample should be taken based on crop type. The sample is taken when the plant is actively growing, so timing is critical. I believe it can be a useful in-field test. However, there are variables such as operator error that would make me uncomfortable using it as the sole means of making fertility recommendations. A brix test is the measure of the sugar content found in a plant tissue sample that has been pulverized, and the aqueous solution from that is then put in a refractometer and read. Once again as with the sap testing, I believe it has in field use especially in a grazing operation. However, the variables associated with it make it suitable for field use and not what I would base a sound soil fertility program on. I work with growers that use it in the field to help with harvest decisions with a tremendous amount of success. Using well-calibrated equipment with consistent protocols for testing has saved them time and money ensuring they harvest at that crop’s peak quality and nutrition levels. Just as with plant sap analysis I believe it can be a useful in-field test. However, there are variables such as operator error and calibration protocols that would make me uncomfortable using it as the sole means of making fertility recommendations. This test is a soil health indicator, measuring the amount of microbial respiration. I would recommend growers use this in conjunction with soil nitrate tests to make a comparison and better calibrate any side-dress nitrogen applications that might need to be applied during the growing season. Microbial identification is done with a microscope. Water can be the carney in the coal mine especially when it comes to greenhouse management. pH is the most critical aspect of water testing in term of a soil fertility program and soil health. However, with water and its natural pH due to its source, comes with its dissolved elements that could be beneficial or not depending on the situation. The best measure to determine the impact irrigation water will have is through testing. As an agronomist, I kill stuff or keep it alive depending on what the farmer wants me to do. What I can also say is I have been doing this long enough to make a definite diagnosis like thrips, aphids, blights, rusts, etc. However, when it goes beyond the obvious, I send a sample to the local land-grant university for identification. That’s what they are for, as well as other services. Ask an animal nutritionist or forage specialist. I can’t be an expert at all things. One of the best agronomists who has an extensive forage background and one I’ve had the pleasure to be around and learn from is Dave Wilson from Penn State Extension. This is in no way an exhausted list. There are several tests that are similar but have different names based on the lab offering them. I am not suggesting that every farm needs to be doing all the mentioned tests. Each one mentioned is another layer of management in the overall plan of how you are running your farm. They are not meant to be used in every case all of the time. Every farmer needs to weigh if the results from the analysis will yield an adequate return on investment for their operation. Just as the title states, they are agronomic testing options. Neither does my tongue. Here’s the story. I’ve been going to acupuncture every week now for the past month. Every week Brian the acupuncturists asks to see my tongue. He reads it like I read leaves when I’m on a farm or in a greenhouse. For the past two weeks, I have been getting a gallon of what is hands down the best ice cream I have ever had since the time I was in doing farm visits around the O’Brien, Florida area. The ice cream I had at one farm would blow your mind. I could be considered somewhat of an ice cream snob. This week I go to acupuncture, he asks to see my tongue, it has a greasy film, he gives me a look, and I confess to the fact I’ve been eating the best ice cream found in the state of Pennsylvania every day for the past several weeks. We have a conversation much as I would have with a grower. I leave realizing the error of my ways and how my ice cream eating is only holding back my progress. Leaf appearance is also a determining factor for deciding the necessity of further analysis such as sap, tissue, pathology or entomology testing. You can google resources for all types of leaf issues. The following are the best I found and I still use them. An app I’ve used is called Plantix. You can pick up to four crops at a time, submit a post for others to comment on and use pictures from your phone. The library is fairly extensive for some common and uncommon issues. The next time your walking around your fields or greenhouses look at the leaves, they never lie. This post isn’t about a great deal on fertilizer or an early order discount program. I happen to be writing it on Black Friday, and that was the best title I could come up with. What we’re talking about are amendments and fertilizers that do double duty. The ones you get more bang for your buck out of. The ones that you could use by themselves or with others. In addition to that topic, everything I’ve been talking about over the past year is all starting to come together. In week 2 – Soil Health vs. Soil Fertility I started laying the groundwork for what I saw as a need in the agricultural industry. Farmers need to have an understanding of basic agronomic principles to be and remain a sustainable and financially viable business while utilizing the incredible resources offered to them by mother nature herself. In week 11 I discussed the similarities between fertilizer blends and pajamas – one size does not fit all. In all seriousness, the fact that fertilizer blends can contain fillers is the real story. A farmer or gardener needs to be knowledgeable of how fertilizer fillers are capable of altering soil chemistry. Crab makes an excellent addition to a fertilizer blend for the extra calcium, and the addition on an enzyme called chitin that has been shown to help control nematodes in the soil. This also makes it an excellent fertilizer for tomatoes. It is also a good source of phosphorus at 15-27% and calcium. When mixed with a calcium source like aragonite, it supplies immediately available and season-long calcium. These are an all-around season long supplier of not only nitrogen, a small fraction of phosphorus, and potassium as well. Alfalfa and cottonseed meal can be cost prohibitive in an organic system. However, if used effectively the benefits can out weight the price. -Cottonseed meal is an excellent option for acid-loving plants like blueberries and roses. It’s a fertilizer, soil conditioner, and acidifier. Both alfalfa and cottonseed meal both have growth stimulating properties that aid in overall plant health. Typical analysis 22%K 22%Sulfur 11%Mg Medium to fast availability. Much like SOP, it is relatively soluble depending on particle size. Kelp can be used as a liquid concentrate, powder, or meal. It can be attributed for being part of all five of the previously listed roles K plays in plant health. If I could only recommend one product, kelp would be it. That being said you still need to use it judiciously as not to decrease its efficacy. Greensand is a good source of potassium, trace minerals, and soil conditioning properties. When I got into organic agriculture and was working for a fertilizer company, I had never heard of anything like greensand. They would explain greensand as being magic. It could loosen tight soils and tighten loose soils. Not being satisfied with the supernatural explanation, I came to learn the power of greensand is in the structure. It has a unique layered structure unlike any other clay giving it the ability to correct a variety of soil structure issues. Hands down I would use greensand before any others. I often recommend a 50/50 mix of greensand and kelp. Another critical point to remember is these materials are used as fillers in fertilizer blends to help products flow better or add to the volume of product for packaging. Just as with other chemistries listed in the NPK value, these interact with the soil and alter the chemistry as previously mentioned. Raw manure is the most nutrient dense. The longer it composts it losses its nutrient value. Over applying it, can lead to not only environmental issues also pest and disease challenges. Typical analysis ranges depending on the manure, however, if used judiciously from a trusted source it can be a great building block for any fertility program adding not only organic matter but nutrients as well. Vinegar is to a farmer as a gym sock and paperclip are to MacGyver. You can do anything with it from kill weeds, clean and disinfect tools, use it as an extract for kelp, greensand or aragonite, and use it to mitigate pH issues in fertigation systems. Would you believe after this post there are only five weeks left in the Ag 101 52 Weeks of Agronomy Series! Since I’ve started writing, a lot has happened not only professionally but personally as well. Last year I came on the speaking scene pretty strong presenting at four fairly significant conferences. This year I have had seven proposals rejected for silly reasons like they didn’t like my title or they felt I was redundant. Funny thing is, I said the title was not set in stone and I had never spoken at that particular conference before. I’ve been called everything from a charlatan to a rock star. It has been brought to my attention that I should ask my family to purchase Grammarly for me as a Christmas gift. Even through all of that, I gained readers all over the world, doubled my email list, recorded a couple podcasts, presented for gardening clubs, and kept writing. Last but not least, I can now say I have clients in six states, and the consulting side of my business is steadily growing. I’ve also gained a new appreciation for my health and hope to keep up with the small but necessary steps to get past some challenges I’ve had. I have completely given up coffee, alcohol, refined sugars, and processed foods along with some other changes without harming anyone in the process. Moreover, that leads me to this week’s topic. Trace Minerals- Small but necessary elements that are critical for plant health. It has been up to debate has how nutrients such as sulfur are viewed. For the sake of this post, I’m going to cover it. Sulfur (S) – Sulfur is needed to manufacture chlorophyll and the synthesis of nitrogen. It also encourages overall plant growth and vigor. Boron (B) – Boron aids in cellular growth and helps to regulate the uptake of nutrients. It is essential for water absorption and the translocation of sugars. Boron and zinc have been linked to aiding in the vegetative and reproductive stages of berry development. Copper (Cu) – Copper works to help plants metabolize nitrogen and is essential for iron utilization. It has been linked to bacterial and fungal suppression as well. Manganese (Mn) - Manganese is known as an activator for several enzymes responsible for plant metabolism as well as nitrogen transformation. Molybdenum (Mo) – Molybdenum plays several critical roles in a plants ability to metabolize nitrogen. Zinc (Zn) – Zinc is required in seed production. It has also been linked to aiding the vegetative and reproductive phases in berry development. An excellent source of potassium and trace minerals along with built-in soil conditioning properties. One of the fascinating aspects of soil nutrient balancing is the interactions each mineral as within the soil matrix and other nutrients. 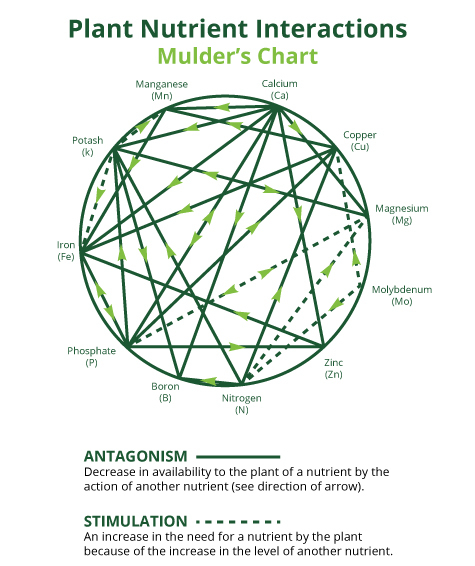 The Mulder Chart is an excellent illustration of that. It also shows the certain dominance cations like calcium and magnesium have over others. If you recall in week 39, we discussed pH and how you use pH to adjust cations and anions. The relationships they have with each other need to be taken into consideration as well as the roles they play in soil and plant health. Calcium and magnesium are two of the major players when balancing soil nutrients. Their ratio is one of the most talked about in the world of soil nutrient balancing. Whether you are of the school backing the ideal 8:1, or some variation of, it can’t be denied the importance of both to not only plant health but soil health as well. It’s calcium’s critical role that brings it front and center in not only soil but plant health as well. 1. Calcium is a flocculating agent that helps stabilize clay and organic matter leading to aggregate stability. Calcium and to some degree magnesium, help chemically bind clay and organic matter helping with better drainage and erosion control by making the soil more stable. 7. Calcium is responsible for proper cell division and cell wall development. Calcium is not mobile on its own in the soil or the plant, leading to the need to be continually supplied. It is transported through the xylem in the plant and dependent on water to complete the process. This is why tomato blossom end rot is not a calcium issue as much as it is an irrigation issue. 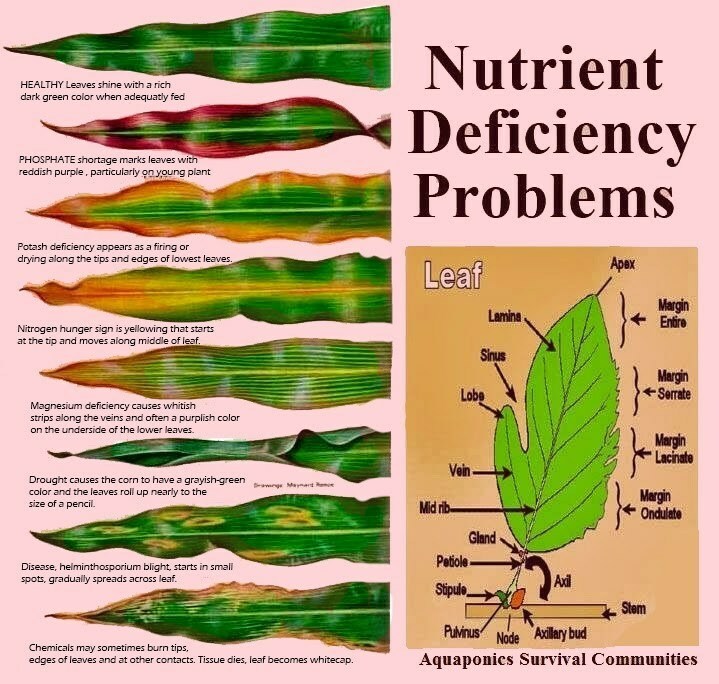 Without a consistent water supply, calcium cannot move into the plant, hence rendering it calcium deficient. One of the main concerns with magnesium in forage crops is grass tetany. It is a metabolic disease when an animal is deficient in magnesium. Magnesium can be often overlooked due to the fact it does not always translate to a higher yielding crop, just a more nutrient dense one. Aragonite is a readily available calcium source. It can be applied in the spring and be available that growing season. It also has a far greater liming effect than once realized, while providing trace minerals and biology to the soil. Raw aragonite brings with is biology from the sea, acting as a built in inocculant. Crab meal is a slow-medium release nitrogen source. It can also be a calcium source depending on how much shell is mixed in. Crab meal also contains an enzyme chitosan, which helps plants build a robust immune system, increases germination rates, and repels parasitic insects and nematodes. Due to the expense, it is often used in fertilizer blends more than a stand-alone. Last week was not my best post. Sorry. I explained how I haven’t been feeling the best and frankly writing on a good day is hard enough for me. It’s harder yet on days where I pretty much want to go back to bed. I’m thankful to be in a position in life I can set my own pace, make my schedule, and I have supportive friends, family, clients, and followers. According to the doctor, I’m not dying. I needed a different medication to reduce the inflammation and eight weeks of therapy. I’ve also decided to make a few more modifications to my diet to keep improving my health and help elevate the grouchy disposition I have had lately. I’m giving up coffee; it might get worse before it gets better. Enough with the pity party, now let’s talk about potassium! I have to admit, potassium (K) is one of my favorite nutrients to talk about. I’m pretty sure it’s because it is a quality vs. quantity factor. I often refer to it as the dessert part of a meal for your plants, and let’s face it that’s my favorite part of the meal. Rely on nitrogen and phosphorus to push yields, but hand it over to potassium to develop kernels, fruit, and blooms. To top off my love affair with it, some of my favorite organic inputs are sources of potassium. One of the best resources I have that talks about potassium is the Soil fertility Manual published by the Potash & Phosphate Institute of Canada. I find it to be a valuable resource for soil fertility in general as well. Ionic balance is the relationship between cations and anions. Which leads to turgor, known as the pressure within the cell wall of a plant that keeps it from wilting. Thank you, Dad, for keeping me in check. Unavailable- This is the form found in the mineral fraction of the soil. It takes the process of weatherization to release and is therefore only available in the soils that are in regions that are well weathered. They are often depleted due to miss management. Slowly available- This form is fixed in layers of potassium silicate clays such as greensand. As the clay shrinks and swells during dry and wet periods the potassium is slowly released. Available- this form is found in the soil solution held by the cation exchange capacity -the fraction of the soil made up of organic matter and clay- but can only account for about 10lbs/acre or less of available K to the plant. Definitely not sufficient for a growing season. Great source especially sheep and bat guano. However, care needs to be taken that you are not over applying and causing the very issues you don’t want like disease and insect pressure. These are an all-around season long suppliers of not only nitrogen, a small fraction of phosphorus, but potassium as well. I list this one hesitantly, however, feel it should be talked about. It can be a good addition especially to a compost pile that has time to rest. The challenge with wood ash is it is over applied and changes the chemistry of the soil quickly due to its particle size and makeup. The adage, a little goes a long way is fitting. Sunflower Hull Ash (K Ash)- Typical analysis 34-36% K Availability dependent on mesh size and pH of soil being used in. Sunflower hull ash is a relatively new product. Although it has some added benefits of having about 4% phosphorus and trace minerals, it should not be used in the soil the has a pH of 7 or higher. It has a pH of 8-10 making its applications limited to particular situations. I often have greenhouse growers run SOP at certain points of the growing season to help keep the plant producing and yielding a marketable size fruit such as tomatoes and cucumbers. It is soluble and has sulfur which can help mitigate higher pH’s that greenhouse growers are sometimes challenged with. As mentioned earlier this is a source of potassium that takes weatherization to release the available potassium that is in the matrix of the granite. Generally used as a component in a fertilizer blends. Kelp can be used as a liquid concentrate, powder, or meal. It can be attributed for being part of all five of the previously listed roles K plays in plant health. If I was reduced to recommending one product kelp would be it. That being said you still need to use it judiciously as to not decrease its efficacy. Refer to week 22 & 38 for more specific uses. I could list other clay-based materials as well. However, greensand is my favorite, especially considering what it is capable of while being a good source of K and trace minerals. When I got into organic agriculture and was working for a fertilizer company, I had never heard of anything like greensand. They would explain greensand as being magic. It could loosen tight soils and tighten loose soils. Not being satisfied with the supernatural explanation, I came to learn the power of greensand is in the structure. It has a unique layered structure unlike any other clay giving it the ability to correct a variety of soil structure issues. Hands down I would use greensand before any others. 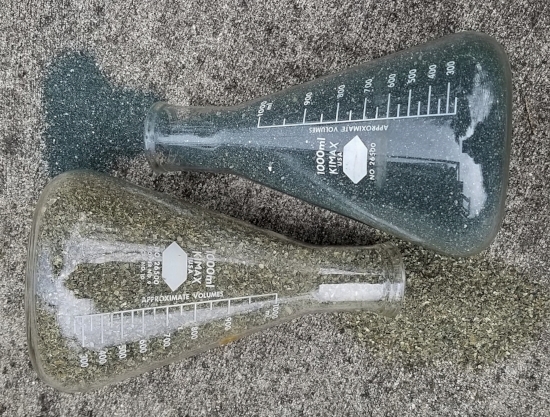 I often recommend a 50/50 mix of greensand and kelp.